Today, as part of Adult Learners’ Week, we’re launching new promotional materials for our programme Reading Ahead. The programme is for young people and adults who struggle with reading or who don’t read for pleasure. Reading Ahead is the new name for the Six Book Challenge which, since 2008, has inspired less confident readers to develop an enjoyment of reading at the same time as improving their literacy skills. More than 150,000 people aged 16 and above have registered for the programme to date through public libraries, adult learning settings, colleges, prisons and workplaces. Nearly 90% of survey respondents in 2014 said they felt more confident about reading after taking part. One in six people of working age finds reading difficult. However, research shows that those who read for pleasure have improved employment opportunities, higher life satisfaction and better health. 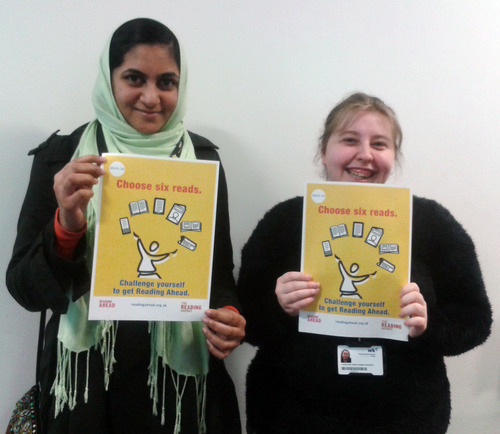 Reading Ahead will encourage even more people to get into reading. The new name reflects the fact that people can take part with other types of reading such as poems, short articles or websites if books feel too daunting. We want it to be a personal challenge whether they’re just starting out or broadening their reading horizons. Keep an eye out for new materials which will be available for people taking part from September.